Most conventional investment option for retail investors particularly for risk-averse investors is fixed deposit (FD) of Banks. Although investing in bank FDs is the easiest among all the investment options, but before investing in bank term deposits you should well understand the considerations such as tax impact, safety, liquidity and effective returns. In the previous post, we had a look at the the taxation of interest income of FDs. This post talks about the 3 other most important considerations to be kept in mind while investing in Bank Fixed Deposits (FDs). Liquidity is an important consideration while making investment decisions. There can be so many reasons for breaking the FDs before the maturity date. Broadly there are two main reasons: first is an emergency need and second is to take advantage of increasing interest rates. Though you’re allowed to break up your bank term deposits, know that premature redemption / encashment of fixed deposits (FDs) involve a cost. Normally, banks give you an interest rate applicable for the period during which the deposit remained in force (i.e., rate of interest applicable for the shorter tenure) which is usually less than the rate of interest applicable for the original duration. For example, if you invest in a 2-yr bank FD offering 9% p.a. and after 1-yr you break the FD and the interest rate applicable for one year FD was (at the time the deposit was made), say, 8% p.a., then you’re going to lose 1% p.a. straight away. Furthermore, most banks (with the exception of a few) also levy a penal charge for premature withdrawal of fixed deposits—usually 0.5%. So, ultimately, in the above example, you’re going to receive interest @ 7.5% p.a., instead of 9% p.a. on your bank FD. But what if the interest rate for the period during which deposit remained with the bank is more than the contracted rate (i.e., the rate offered for the original maturity of a term deposit)? To safeguard against such a possibility, banks usually put the clause that interest on premature withdrawal of a term deposit will be payable at the rate applicable for the period for which the deposit remained with the bank or the contracted rate, whichever is lower, less penalty as applicable. Bank deposits are covered by Deposit Insurance and Credit Guarantee Corporation (DICGC) insurance up to a maximum amount of Rs 1 lakh per person per bank. Please remember limit of Rs 1 lakh includes all deposits whether held in savings account, fixed deposits account, current account or recurring deposit account. 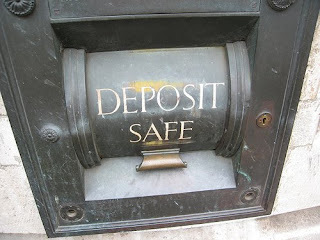 Although bank fixed deposits offer a lower interest rate vis-à-vis company deposits, these are considered better from safety point of view because company deposits are completely unsecured. The return consideration is the most important consideration while making a decision for investing in Bank FDs. Here you should be concerned with post tax returns i.e., how much net amount of interest income is left to you after paying the tax. For example, if your marginal income falls in highest tax bracket (30.9%) and you invest in a bank FD with 8% rate of interest, then your effective post-tax return from the FD will be 5.53% and if you happen to fall in middle tax bracket (20.6%), then the post-tax return would be 6.35%. In next part, I’ll let you know some practical tips for making the most of your investment in bank fixed deposits.